Good morning. Organising an event of this scale inevitably will cause some sleepless nights. But on this occasion our happy worry which Vincent told me is there may not be sufficient seats. So we are much encouraged by the overwhelming and positive response that we have received. I am much delighted to welcome you all to this year's Belt and Road Summit. The Hong Kong Special Administrative Region Government is pleased to join hands with the Hong Kong Trade Development Council to co-organise this second edition of the Summit, following an extremely successful inaugural edition in May last year graced by Mr Zhang Dejiang, Chairman of the Standing Committee of the National People's Congress of the People's Republic of China. Entitled "Give Play to the Unique Advantages of Hong Kong and Jointly Create a Bright Future for the Belt and Road", Mr Zhang's keynote address last year has provided us with much food for thought and impetus for action. On this occasion, we are equally encouraged by the presence of so many government and business leaders from around the world. We are gathering here today to examine the opportunities as well as the challenges arising from this far-reaching Belt and Road Initiative. 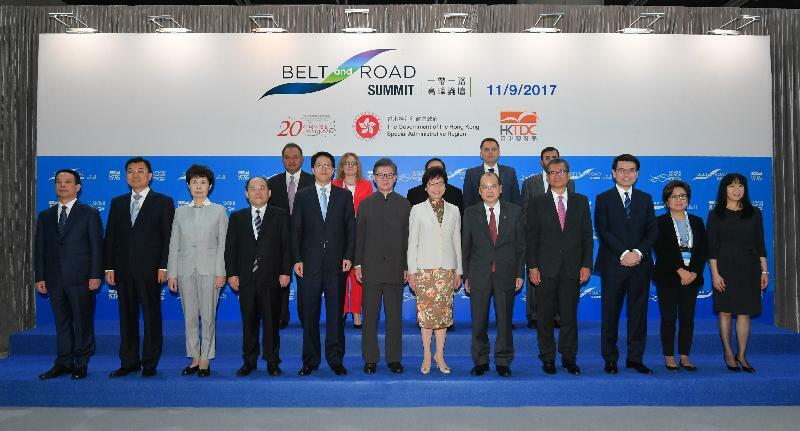 As you know, the Belt and Road Initiative is a multi-faceted and multi-platform endeavour driven by several ministries in the Central People's Government. We are therefore especially pleased and honoured that Mr Ning of the National Development and Reform Commission, Madam Gao of the Ministry of Commerce and Mr Xie from the Ministry of Foreign Affairs are joining this keynote session. We look forward to their sharing on the formulation and execution of the Belt and Road Initiative from different policy perspectives. "From Vision to Action" is an appropriate theme for this year's Summit. Since President Xi Jinping unveiled his vision for the Belt and Road Initiative in 2013, more and more governments and enterprises around the globe have got involved in the action. The "Vision and Actions on Jointly Building Silk Road Economic Belt and 21st-Century Maritime Silk Road" was issued in 2015 by the NDRC, MoC and MFA. This provides us with a blueprint for taking forward the Initiative. The core principles for the Belt and Road are "five areas of connectivity", namely policy co-ordination, facilities connectivity, unimpeded trade, financial integration and people-to-people bonds. This requires a new mindset for positive globalisation in the 21st century, a mindset for international connectivity that is unrestrained by political, economic and cultural differences. The Initiative will have a significant impact, not only for China and Asia, but also for countries along the Belt and Road routes and beyond. We can see the strategy taking shape in a variety of forms, ranging from infrastructure projects and the setting up of economic co-operation zones to new freight and shipping links and cross-boundary economic corridors. 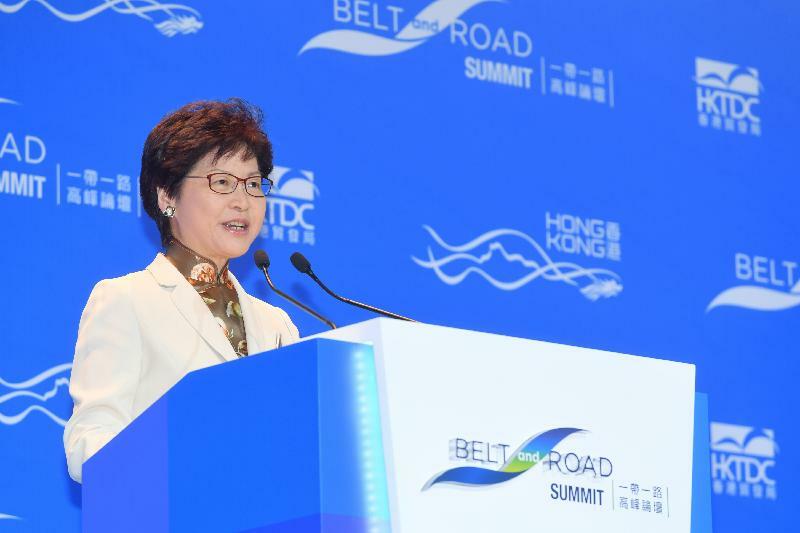 As an international metropolis and China's best-connected city, "a key link for the Belt and Road" as described by Mr Zhang in his speech last year, Hong Kong can, and will, make immense contributions to the Belt and Road across all the "five areas of connectivity". In doing so, the Central People's Government fully supports Hong Kong to capitalise on our unique advantages under the "one country, two systems" formula. This high-level support is clear to see. Since the beginning of this term of the Hong Kong Special Administrative Region Government on July 1 this year, my colleagues and I have engaged in earnest discussions with the Central Government on a new co-operation agreement that would give full play to Hong Kong's unique advantages under "one country, two systems" in support of the Belt and Road Initiative. It will be another landmark agreement between Hong Kong and the Central Government since the signing of the Closer Economic Partnership Arrangement, that is CEPA. Collaboration strategies under the agreement would cover key areas such as finance and capital raising, infrastructure facilities, trade and investment facilitation, project information sharing, interfacing and dispute resolution, as well as promoting people-to-people bonds. The proposed agreement will serve as a guide and roadmap for mutual co-operation and understanding. We will continue to discuss details of the co-operation framework with a view to signing the agreement at the earliest opportunity. By leveraging this new platform and working closely with our counterparts in the Mainland and overseas, I am confident that Hong Kong's enterprises and talents will be able to fully engage in the Belt and Road Initiative and reap many benefits. As this theme of this year's Summit suggests, the Hong Kong SAR Government has also to turn our role in this national strategy into action. Our action plan envisages building on our existing strengths, including a high degree of autonomy in conducting our external affairs as provided for under the Basic Law, and exploring new advantages. In the course of these efforts, the Government will play the additional roles of being a "facilitator" and a "promoter" advocated in my election manifesto. To underline our determination, we will adopt a fiscal policy conducive to seizing those many opportunities, involving wise investment and competitive tax measures. I have asked the Secretary for Commerce and Economic Development, Edward Yau, to lead and co-ordinate efforts in participating in the Belt and Road Initiative. No doubt Edward will talk more about this topic in Session 1 of the Summit this morning. The second session this morning puts the spotlight on infrastructure development, with a focus on the ASEAN (Association of Southeast Asian Nations) region. Not only is ASEAN strategically located on the Belt and Road routes, the region's emerging economies are seen as future drivers of the regional and global economy. Since becoming Hong Kong's Chief Executive in July, I have already visited Singapore and Thailand to meet with government and business leaders in the region. My administration will continue to strengthen ties with the region's 10 member states. I am pleased to tell you that we have recently successfully concluded a Hong Kong-ASEAN Free Trade Agreement (FTA), which will significantly boost our links with ASEAN. I look forward to the formal signing of this FTA in November this year. The agreement will further enhance flows of trade and investment between Hong Kong and ASEAN, at a key intersection for the Belt and Road. We will explore entering into more FTAs and other bilateral accords such as investment promotion and protection agreements and comprehensive agreements on the avoidance of double taxation, with governments around the world. We have also signalled plans to expand our network of Economic and Trade Offices (ETOs) along the Belt and Road. In ASEAN, we opened a new Economic and Trade Office in the Indonesian capital Jakarta earlier this year and we have plans for another ETO in the region in the future. Undoubtedly, ASEAN will continue to be a focal point for the Belt and Road, with a number of major collaborative projects already under way in the region. Behind the infrastructure investment in the Belt and Road, a variety of professional services are required to turn plans into vivid reality: investment and risk assessment, research, financing, insurance, accounting, legal services and arbitration. Today, these services sectors represent new economic drivers for Hong Kong and are essential to the Belt and Road vision. For example, our services professionals support Mainland and overseas enterprises' outbound investment. We also offer an effective dispute resolution hub for Belt and Road-related projects. Our Secretary for Justice, Rimsky Yuen, will share his thoughts on this subject during the thematic breakout forum this afternoon. Raising capital for Belt and Road infrastructure projects is another challenge. In a recent report, the Asian Development Bank estimates the annual infrastructure investment requirement in Asia between 2016 and 2030 will be around US$1.7 trillion. That is about double the current infrastructure investment level in the region. As China's international financial centre and a member of the Asian Infrastructure Investment Bank, AIIB, since June this year, our city is set to play a pivotal role in facilitating the Belt and Road projects. The Infrastructure Financing Facilitation Office set up in the Hong Kong Monetary Authority last year and its many member institutions stand ready to meet the growing financing needs for projects along the Belt and Road and elsewhere. We should not ignore the importance of sustainable development. Among others, we aim to foster green finance, establishing a green bond market, formulating green credit guidelines, setting standards and assessments for green financing, and so on. We look forward to working with different governments and organisations to jointly promote sustainable development of the Belt and Road. Ladies and gentlemen, this Summit is a truly unique opportunity for the international community to gain an Asian perspective on the Belt and Road and for us to engage with stakeholders from different countries. Gathering policymakers, project owners and investors from around the globe, I am confident that this Summit will help keep the Belt and Road Initiative on course "From Vision to Action". Finally, I thank Vincent and his team at the Hong Kong Trade Development Council for co-organising this event. May I wish everyone a very fruitful Belt and Road Summit and our visitors a most enjoyable stay in Hong Kong.